It is more important than ever to protect your identity and security. The most effective way to eliminate confidential documents and personal information involves using a paper shredder. The MBM Destroyit will protect your identity and personal documents by using a cross cut. The cross cutting action cuts your sheets into tiny little squares making it nearly impossible to put back together. This heavy duty, high capacity cross cut shredder is an ideal choice for organizations where high volume document shredding is required. The Destroyit 5009 has high front loading for huge materials such as crumpled paper from wastebaskets. This machine has an extra-large feed table with conveyor belt and electronically secured safety guard for the user’s protection. The Destroyit includes an easy to use control panel with push buttons for forward, stop, and reverse, a safety lock and key, a main switch, and an emergency stop button. There are also two automatic speed modes: “Power” for bulk feeding large quantities of paper and “speed” for high speed shredding of smaller amounts. 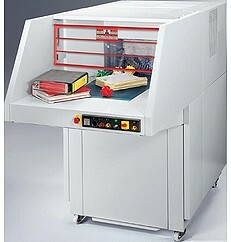 The Destryoit can also cut through hardened steel, and the cutting shafts are soft metal resistant as well and can cut through CDs, VHS tapes, hardbound documents, and 3-ring binders. This 79 gallon shred volume shredder automatically powers down when shred bag is full or when cabinet door is opened. The Destroyit comes with a mobile shred cart with a bag mounting frame for easy replacement of disposable shred bags and the electronically secured door at the back of the machine allows safe and easy removal of the shred cart. This machine comes with a lifetime warranty on the cutting shafts and there are convenient, centralized oilers for lubrication of the cutting head. If you have any questions or are interested in purchasing the MBM Destroyit 5009 Cross Cut Shredder, visit us at SpiralBinding.com. We have great pricing on a full line of Paper Shredders. Call us at 1-800-631-3572 for more information.